(posted Thursday, May 27 5:11p local time) The Chinese pairing system in use at the WAGC produced a boatload of interesting matches in the third round Thursday morning. Taewon Jo of DPR Korea, who had defeated Yohei Sato of Japan in the second round, now found himself facing 11-year-old Cheng-hsun Chen of Chinese Taipei. The game began with two variations of the avalanche joseki in adjacent corners, leading to a large-scale game with each side amassing over a hundred points worth of territory, including captured enemy groups. 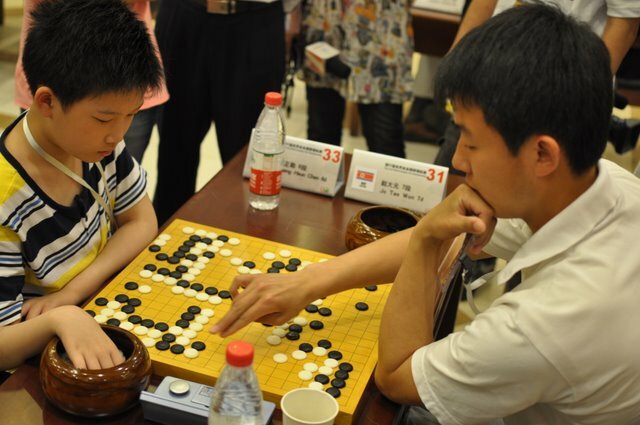 Facing an imperturbable opponent, Chen appeared to be in a state of high anxiety in the middle game as referees, reporters, and players whose games had already finished began to gather around the board to watch. At the end, however, he was playing with quick confidence, wining on the board without needing komi. As previously reported, the third round’s big upset occurred on the twentieth board, where Maria Puerta 3k of Venezuela defeated Wan-kao Lou 5d of Macau. “For most of the game he was in control,” Puerta said. “He had a big territory and I had some dead groups, but then late in the game he let me capture four stones. Perhaps it was just lack of caution on his part, but that four-stone capture joined all my groups together, and inside the large space surrounded by them there was a group of his that only had one eye. He still had his big territory left, but it wasn’t enough, so he resigned.” Cementing the 100% women’s win in the round, Francesca Mauri of Italy defeated Joseph Michael Galero of the Philippines. 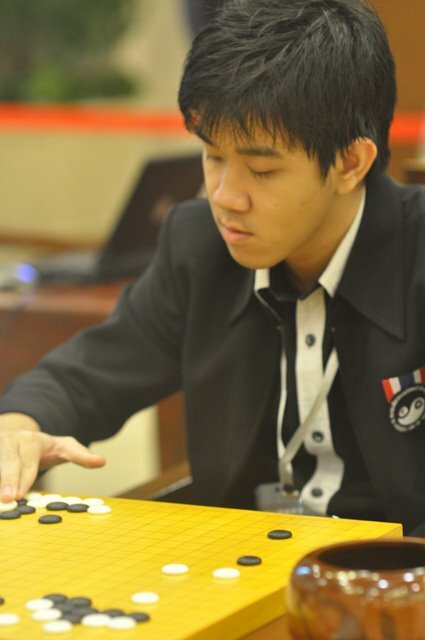 On the other top boards, the players from China, Hong Kong, and Korea remained undefeated by beating opponents from Israel, Canada, and Austria. A pair of North and South Americans also remained defeated: Thomas Hsiang 7d (US) overcame a strong challenge by David Ormerod 5d (Australia), and Fernando Aguilar 7d (Argentina) defeated Pal Balogh 6d (Hungary). Leszek Soldan 5d of Poland likewise remained undefeated, beating Kamon Santipojana 4d of Thailand (in photo at right; see below for Michael Redmond 9Ps commentary on the game), and in an all-European match, 18-year-old Frederik Blomback 5d from Sweden scored his third straight win by handing veteran Christoph Gerlach 6d of Germany his second loss. In the fourth round, the four undefeated Far Eastern players will take on the four undefeated players from Europe and the Americas.